Implant supported dentures are a marriage between the old and the new. Dentures have literally been around for centuries. Wooden dentures date back to the 16 th century in Japan. In 1820 a goldsmith manufactured high-quality porcelain dentures that were mounted on 18-carat gold trays or plates. On the flip side, dental implants first became practical around 1965. Over 800,000 dental implants were placed last year while 178 million people were missing at least one tooth and roughly 15% of them got dentures made. That is a staggering 26 million dentures that might be made every year. Implant supported dentures have only been in existence for less than 20 years. We’ll look at dentures first, explain an implant, then the process of putting both applications together. We’ll identify the benefits for this treatment option, the life expectancy of the implant, and the care necessary to keep the fixture and prosthesis stable and functional for some time. Dentures are a prosthetic device that replace missing teeth. Most conventional dentures are removable and rest on top of the gums. When enough gum and bone is present, an upper denture is held in place by suction. Because of the tongue, the lower denture typically does not get the aided retention of suction and is often held in place with denture adhesive paste or creams. After wearing dentures for some time, the gum and bone may begin to recede, as the teeth and bone work hand in hand to hold one another in place. Once the teeth are extracted the bone or ridge gradually erodes making the fit of the denture more difficult. A dental implant is when you have a tooth missing and you wish to replace that tooth in a permanent fashion. If you have good quality bone in an appropriate quantity, a titanium post will be inserted into your jaw in the area of the missing tooth. An abutment extension is put on the post in order for a natural looking crown to be attached to the implant. Like teeth, dental implants help preserve the bone integrity and quantity. They are a very natural restorative option that aid in providing function and esthetics. So, let’s put those benefits with the dentures. You understand the concept behind the dentures. You understand that the dentures just sit on your soft tissue and are held in place with nothing more than a bonding cream or suction. Now, add several implants and they will serve as anchors for the dentures. There are two different types of dental implant supported dentures. The first is like a snap on a shirt or jacket. The post attached to the implant has a ball on it. The socket will be inside of the tray of the dentures. Aligned perfectly the denture snaps onto the implant abutment and is held in place. The second type is that a bar is attached between several implant posts. Then there is a slot on the inside of the tray and the horizontal bar easily slides into this slot. The process itself is a bit involved. First and foremost, an in-depth consultation determines whether you are a viable candidate for implants. 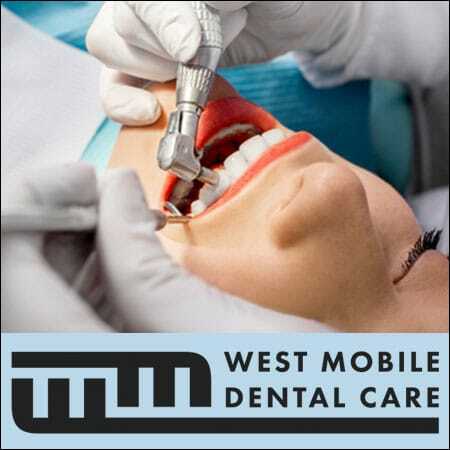 Dr. Schrader with West Mobile Dental Care will evaluate your jawbone to determine the predictability of placing implants in your bone. Once we determine that implants are a good option, the first step is to make a temporary denture, which can be used to test and confirm teeth placement and bite patterns. Once the temporary denture is completed a copy can be made that will serve as the guide to where the implants will be placed. This first set of dentures can also be kept as a backup. Placement of the dental implant step is the next in the process. The area to receive the implant will be numbed first with a local anesthetic and then a small incision made allowing access to the bone for the insertion of the implant. The incision site will take several weeks to heal, and the titanium post will take roughly three months to integrate into the surrounding bone. After it is determined that implant has adequately fused to the bone and is ready to support the denture, the abutment is inserted into the implant and the denture modified to receive the attachment. There are many benefits to having implant supported dentures. The first is that there is typically no bonding cream necessary to attempt to hold them in place. The second follows that same thought, as they will not slip around of flop around in your mouth when you speak or eat. This goes a long way with chewing, eating, speaking and smiling with confidence. With implants you still retain the ability to remove the dentures and take proper care of them. You will need to remove your implant supported dentures every evening in order to properly clean them. They cannot be allowed to dry out; it will destroy the acrylic trays. You will need to use a tooth brush to clean them with soap and water, as tooth paste is too abrasive for the acrylic teeth. Similarly to promoting good gum health around natural teeth, you need to also brush the implant posts and the soft tissue. 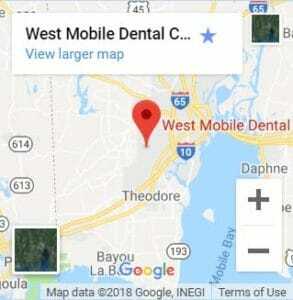 You will want to continue with regular appointments at West Mobile Dental Care. They will monitor the fit moving forward and make sure your gums are healthy. Sometimes you may notice the denture becomes loose and the plastic clips or attachments will need to be replaced. All in all, this is a great solution if you have lost several or all of your teeth.